Developing Story: Jack Maclellan - College Hockey, Inc.
Jack Maclellan is one point shy of his third straight 30-point campaign. Ice time is valuable, as anyone who has tried to rent 50 minutes at their local rink can attest. It’s also a necessity for anyone hoping to improve their game and advance to the next level. 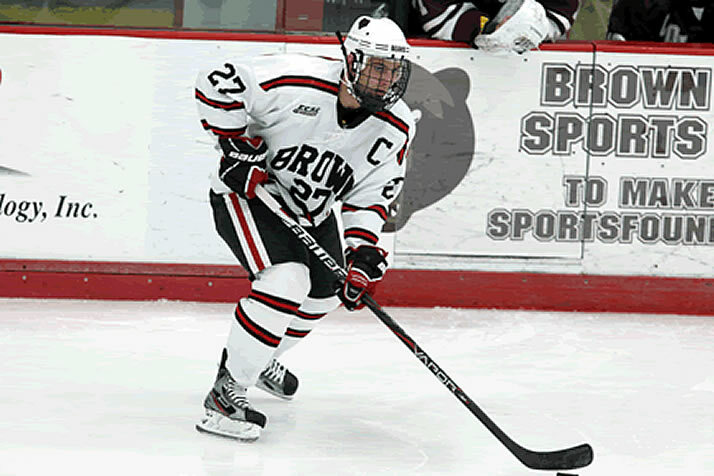 That’s where Brown University’s Meehan Auditorium has proven invaluable for senior forward Jack Maclellan. In addition to extensive practice time, Maclellan has taken advantage of extra ice time, in particular developing his skating to help him become an elite player in ECAC Hockey and a top NHL prospect. Maclellan cites his skating as the most improved part of his game, although he said he has developed in all areas. He scored two goals and totaled six points as a freshman, in his first season out of the Alberta Junior Hockey League. The speed of the college game opened his eyes and he set out to gain an extra step that he felt he had in juniors. While a player’s skating stride tends to be fairly ingrained, Maclellan has improved his footspeed through sprints, plyometrics and other efforts. That work propelled Maclellan to three straight 14-goal seasons. He’s got 15 this year and his next point will be his 30th. The undrafted free agent seems poised to follow in the footsteps of former teammate Harry Zolnierczyk, who has split this season between the Philadelphia Flyers and Adirondack Phantoms. Zolnierczyk’s development took longer than Maclellan’s – he didn’t score his first college goal until the playoffs of his sophomore season. But hard work put Zolnierczyk in position to earn an NHL contract, and Maclellan has followed that lead.